Kevin Strootman – Potential Arrival at Old Trafford in the summer? It has been reported today in the Sunday Mirror that Manchester United are closing in on the signing of Kevin Strootman of PSV Eindhoven. Strootman has been scouted by United around 12 times this season, which certainly shows the club have some interest in him. The 22 year old midfielder has been courted by many teams in the last year or so. Wesley Sneijder was also asked about him when Inter Milan were looking for reinforcements during last summer. 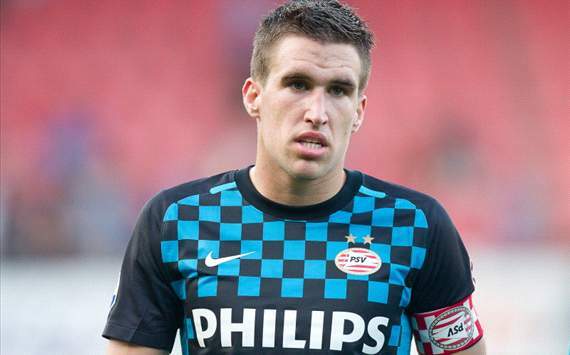 Strootman, dubbed ‘the new Roy Keane’, currently plays for PSV Eindhoven and has played in 10 of the last 11 matches for the Netherlands at senior international level. He missed the win versus England back in February due to injury. He started his professional career with Sparta Rotterdam where he made 72 appearances and scored 8 goals. He has also played 14 games for Utrecht scoring twice before being transferred to PSV Eindhoven last summer. To date he has made 25 appearances, scoring twice. Strootman has found form and established himself in the first team, also securing the vice-captaincy for the club. At International level, Strootman has always played for the Netherlands, 3 times for the under 18’s, 4 times for the under 19’s, scoring once, 4 times for the under 21’s and 10 times for senior level, netting one goal. Sir Alex Ferguson is believed to be an admirer of Strootman and with United looking to sign quality midfield players, insiders at the club believe a deal is close to completion. In the past United have signed Ruud van Nistelrooy and Jaap Stam from PSV Eindhoven, both of whom have become club legends. Below is a video of Kevin Strooman I found on YouTube. I think if United did actually sign him, he would be a good addition to the squad and a possible ‘leader’ on the field of play!